June 12, 2016 . Review by Editor. 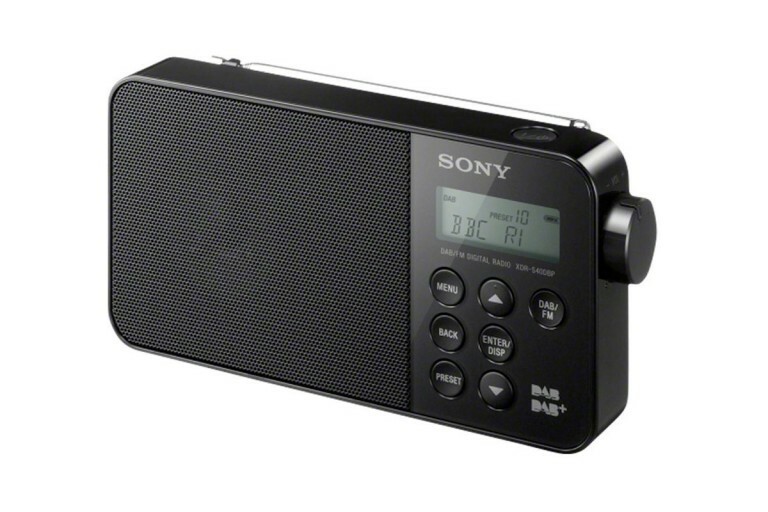 Sony's XDR-S40DBP is a well designed and easy to use portable digital radio. The portable radio category is one of the most varied for design and features with fierce competition from budget brands on price. Our Sony XDR-S40DBP review looks at a welcome entrant with a thoroughly functional approach. It appears Sony has considered carefully where and how small radios are used. Many radios are only used to listen to a single station and sometimes at certain times of day. When a radio is mainly used for Planet Rock or BBC Radio 4 it’s possible to prioritise some functions over others. The Sony XDR-S40DBP therefore cleverly places the power button on the top – ensuring the unit won’t move around on a surface due to its light weight. The volume control is found on the side with a rotary knob, and the buttons for choosing stations and changing settings are placed on the front. The headphone socket is found on the left side, a much more logical placement than the back of the radio. The speaker grille is metal with the rest of the surfaces in shiny black, making it something of a dust and fingerprint magnet. The single 6.6cm speaker offers a fairly low 0.3W audio output power. Audio output of this level isn’t unheard of on small DAB/FM sets but most of this size offer around 1W RMS. In practice it doesn’t feel quiet. In a kitchen or bathroom the audio is certainly loud and clear enough for music and speech programmes. Whilst the volume knob can be turned past half way in a lounge or bedroom you’re certainly reminded this is a small radio. Listening to Jazz FM there is plenty of clarity and no hints of distortion, but bass and some piano sounds are not terribly full. Planet Rock and BBC Radio 5 live are perfectly acceptable with enough oomph left when you just have to turn up that song or hear commentaries over the washing machine. A mix of music and speech on Sounds of the Seventies is very clear on DAB digital radio and FM. The radio can be powered using the included mains adaptor or four AA batteries. The adaptor has a very generous lead compared to some of its rivals and the use of size AA batteries means you can use your own rechargeables without buying a special add-on. Expected battery life is around 13 hours for DAB/DAB+ or 10 hours of FM use. The power adapter is plugged in on the same side as headphones. The telescopic aerial extends to around two feet / 60cm and can be moved in all directions. The DAB auto tune function is quick and stores available stations alphabetically. The station list can be browsed using the up and down buttons on the front of the set. 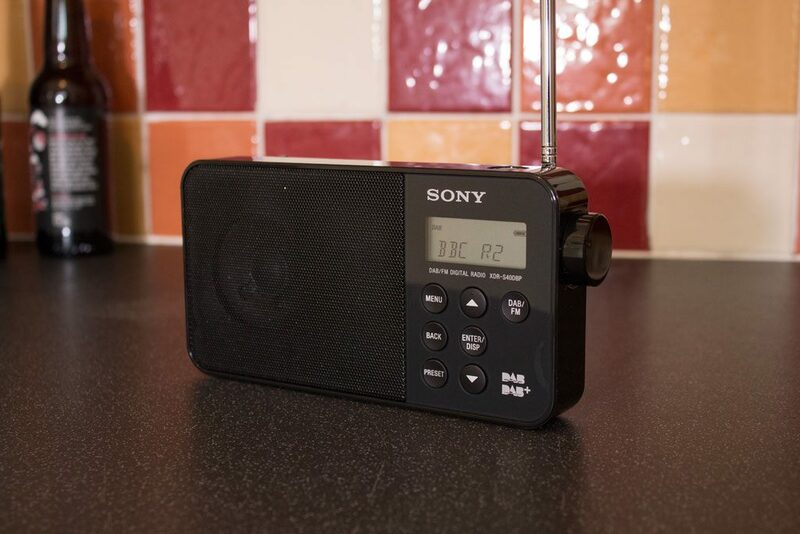 Local stations on FM can be found with a press of the DAB/FM button. Curiously RDS appears to be missing. 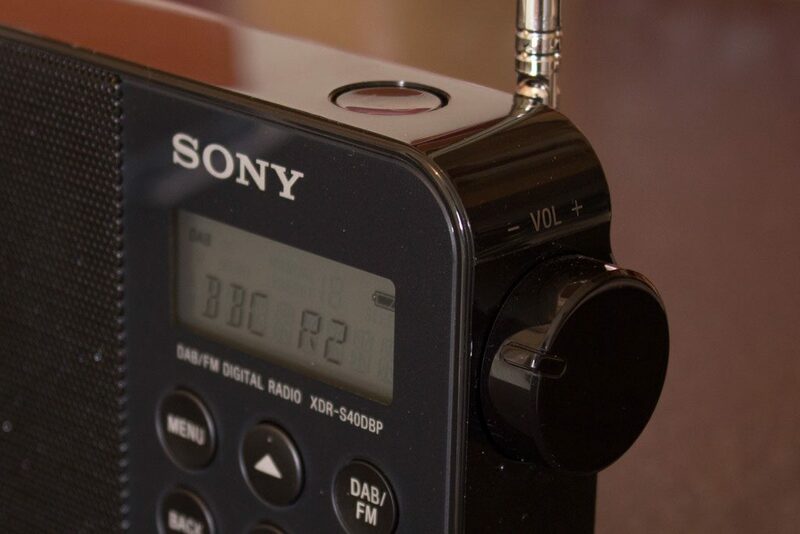 The vast majority of FM and DAB radios do support RDS – the system which displays radio station names and other information. Tuning into FM radio stations shows only the frequency. The display features an orange backlight which switches itself off after a few seconds. When being powered by the AC adaptor its possible to set the backlight to always be on which certainly makes it more legible. One of the advantages of DAB is the scrolling text with information about the current song or programme. Text is displayed on a single line and a shorter version of the station name is displayed by default. A press of the Display button will reveal the scrolling text and another press will show the time. Reception of digital radio stations on the Sony XDR-S40DBP is good. The auto tune found all of the BBC’s national stations, plus the national commercial stations and new DAB+ stations. As the radio can receive FM, DAB and DAB+ it picks up Jazz FM and Fun Kids just fine. Compared to the Pure One Mi in the same location it didn’t find as many stations, but moving from one end of a windowsill to another did improve reception. The radio feels well built and buttons don’t require too much force when pressed. The simple design is certainly not one of the most interesting or exciting around, but should fit nicely on a kitchen windowsill or bathroom cabinet. Compared to some models the radio isn’t very deep and doesn’t have four individual feet, so it doesn’t feel very planted on surfaces and is easy to knock over if you happen to catch the telescopic aerial. However the compact size does make it easy to take from room to room, or even drop into a bag or suitcase to take away. With its impressive design and good sound quality the XDR-S40DBP is possibly the best portable radio in this price bracket. The lack of RDS to display station names and scrolling text for FM radio stations is disappointing. There are occasions when even with the long telescopic aerial fully extended a digital station can’t be received, but slight adjustments appear to get around this. For living room settings where sound quality is more important, or garages and offices requiring more volume, there are more suitable alternatives. For sport commentaries or listening where earphones will be used most of the time the smaller Sony XDR-P1DBP is worth considering.